The vibration-insulating devices will be made of metal rubber (MR material), a unique damping material developed by the Samara scientists and produced in the university's laboratories. MR material has the useful properties of rubber, while at the same time withstanding aggressive agents, high and low temperatures and other adverse external factors. The secret lies in the special technology of plaiting and pressing the spiral metal strands of varying diameter. The dampers produced by this method and based on the MR material are significantly superior (in particular, in reliability and life) to similar versions known in Russia and abroad. They are used successfully in producing Russian space equipment. 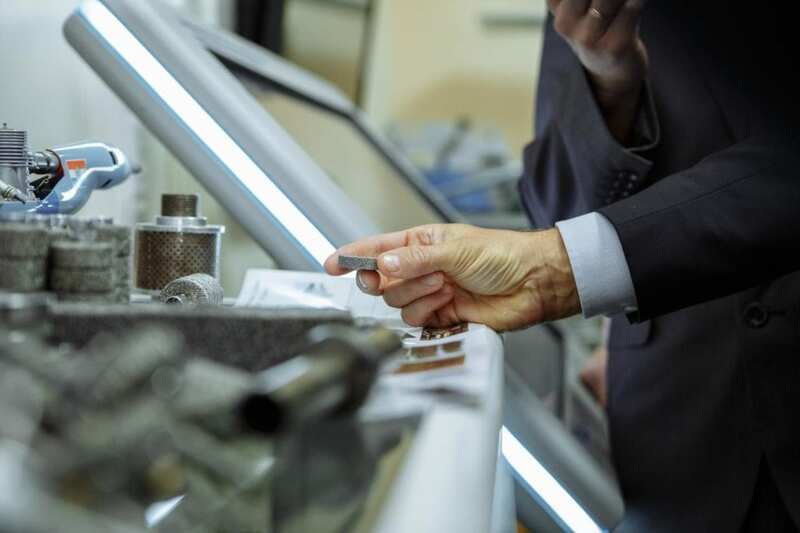 "Rubber vibration insulators are cheap, but impractical for use in complex climate and temperature conditions," explains the Deputy Chief Designer of the Sector Research Laboratory ONIL-1 of Samara University, Danila Davydov. "Under the influence of temperatures, rubber loses its properties and fails. Cable vibration insulators have a short life, the cable strands wear through quickly and moreover, they cannot be installed everywhere due to their large dimensions." Due to their all-metal structure, items made of MR material easily withstand temperatures up to 400°C, and also have high service life indicators, since deterioration processes develop comparatively slowly in them. Yet another important feature of the metal analogue of rubber is that during deterioration of the pressed strands of the spiral inside the vibration insulator, its damping properties are intensified. For example, the vibration insulators made of MR for locomotives have a 25-year quality warranty, and for space equipment a 15-year warranty. The STM holding is currently developing a line of promising diesel locomotive models equipped with the latest Russian high-speed diesel engines. The mechanical engineers in July 2016 proposed that the Samara scientists develop vibration-insulating devices for these engines. STM was interested in the innovative vibration-insulating systems in order to minimise the effect of noise and vibration on the diesel locomotive frame and engineers' cab. The high-speed diesel creates an elevated vibration load that especially increases the fatigue of the locomotive team during a trip and the risk of occupational illnesses of its members. ONIL-1 at Samara University has already completed the design work and is preparing for production of the vibration insulators made of MR material for diesel locomotives: the relevant calculations and experiments have been made, and the requisite technical documents have been created. Vibration-acoustic processes accompany the operation of any machine, from computers to airplanes and spacecraft. Even the slightest fluctuations in this case perceptibly affect the quality and reliable operation of both individual assemblies and the entire unit. The use of systems for acoustic and vibration protection not only greatly extend the service life of complex and expensive equipment, but also make its operation more convenient and comfortable for people. Basic and applied research in this field is therefore in greater demand in many sectors of mechanical engineering: in the production of transportation, energy, automotive, metallurgical and petrochemical equipment, as well as spacecraft assemblies. The fundamentals of the scientific and practical school of dynamics and vibration acoustics of machines was established in Samara (Kuybyshev) over a half century ago. Today this school of thought is among the world's most authoritative and it is the brand of Samara National Research University. One of the recent research results of the university's scientists in the field of protecting aviation and aerospace equipment from dynamic and vibration-acoustic effects was the development in cooperation with RKK Energia and the Institute of Medical and Biological Problems of the RAS of a new running track for the International Space Station (ISS), the BD-2 training complex. This training equipment was equipped with an innovative vibration-insulating system to eliminate hazardous, low-frequency oscillations in the ISS structures, while preserving its service life and successfully replaced the American-made running track. During its work on the ground, ONIL-1 created a unique test stand to conduct service life, independent and other types of tests, and also to perform exercises on the BD-2 training equipment, installed on a system of vibration insulation, simulating weightlessness conditions. The BD-2 training complex with vibration insulation has been in regular operation since 2013 and has passed flight tests on board the ISS.